Biofuel is a fuel from biological raw materials. Any animal or vegetable fat can become raw materials for production of the natural diesel practically. Biodiesel economy is really changed after technology was allowed to make fuel from algas, commercial crops, animal fats and even the fulfilled culinary oils can become the most widespread source of fats. This fuel is safe in production and use, it is exposed to a natural cycle of disintegration, than considerably reduces quantity of the pollutant in air. Full combustion of biofuel reduces quantity of a monoxide of carbon which the atmosphere becomes soiled from year to year. The principle of the fulfilled biodiesel environment processing comes to parameters of the closed natural system because the thrown-out carbon again is used for growth of plants which in the future also become fuel. Despite lower power consumption of the biodiesel economy, it is oxidized better and gives approximately the same quantity of energy, as well as traditional diesel fuel. At the same time temperature of flash of the biodiesel exceeds 150 °C that favorably distinguishes it from the ordinary diesel (64 °C) and gasoline (45 °C) and does storage of biofuel much safer. This fuel is the only alternative which works in any ordinary diesel engine without any modifications. It can be stored in the same places where regular fuel is stored. For biodiesel economy and improvement of fuel properties the biodiesel can be used independently or in a mix with diesel fuel in any proportions. The mix of 20% of the biodiesel, and 80% of the ordinary diesel is called “B20” and it is the most widespread. At a cycle of production and use of 80% emissions of carbon dioxide, and by 100% of dioxide of sulfur are reduced. Combustion of the pure biodiesel provides more than 90% reduction of total number of hydrocarbons which is don’t burn, and 75-90% aromatic hydrocarbons. Biofuel also provides considerable reduction of carbon oxide particles, in comparison with diesel fuel. It contains 11% of oxygen on weight and doesn’t contain sulfurs. Use of such fuel can prolong service life of engines because its lubricant properties surpass properties of usual diesel fuel. 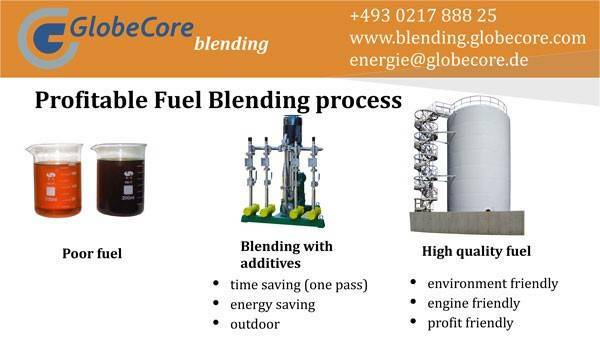 The GlobeCore Blending company is intended in production of biofuels blending systems in a stream. Basic purpose of these installations is the intensification of processes of dispergating, homogenization and emulsification various liquids at first sight it would seem not mixed . In the final result after processing form the steady fine mix, the received product has resistance to a continuous uniform period of storage and steady against stratification. If you want to reduce expenses of you company for fuel production, “USB” cavitation blending system could help you to do that. To receive extra information contact us and technical manager will call you back or download inquiry list and receive free catalog.